When it comes to touring bikes, there are so many options out there it can often be overwhelming. You can customize nearly everything on a touring bicycle these days, and there are so many fantastic frame builders and standard touring frames its often hard to know where to start just picking a frame!. Choices of components expand the customization to another level and this is no less true for brakes. brakes, and all levers do not work with all the different types of brakes. There is one specific component which does not have a plethora of choices when you are setting up a touring bicycle, and that is brake levers for drop bars on a touring bicycle. 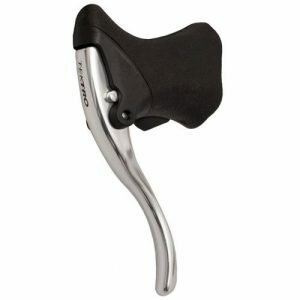 V or Cantilever brakes (like both Claire and I do) there is a limited amount of choices available. 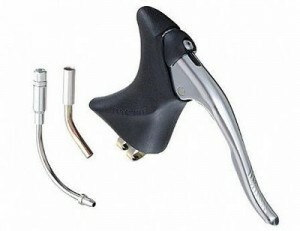 This is because most drop bar levers do not provide the required leverage to properly engage this type of brake. Not to fear! There are a few options that are made solely for the drop bar and v or cantilever brakes combination.. They do the job. But, they are uncomfortable. I bought my levers used and perhaps I have an old model, which dates from back in the days where brake hoods were nothing more than a piece of wafer thin rubber no better than a linoleum tile. This is a pretty big flaw in my opinion, I tend to ride on the hoods quite a bit, and I just couldn’t hack it. Initially I looked into getting replacement hoods, but quickly realised that there were no options out there whatsoever. I instead used a length of old inner tube wrapped around the hoods to create a bit of cushioning. I have since purchased a pair of G-Shock Gel hood covers, which look promising… review to follow. 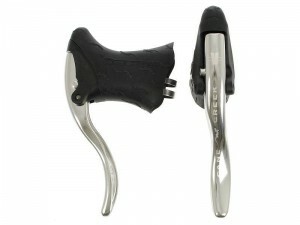 I have used the Cane Creek Drop V Lever during our 2 week adventure down the West Coast of the US. These levers are a bit more modern than the Dia-Compe and are far more comfortable. They have an integrated quick release pin, which is a handy feature when you are trying to get your wheel off. But the best feature which is of no practicality whatsoever, the embossed lizards on the rubber hoods. Claire has the Tektro brake levers and has been happy with their comfort and performance. They have a comfortable rubber hood for resting your hands while riding. The RL520 also has an integrated quick pin like the Cane Creek levers for easy removal of your wheels. The levers have a strong pull and have otherwise been perfect so far. The only issue which Claire has had, is that the levers are too large for her hands. This seems to be a common problem that women (or anybody) with smaller hands have when using drop levers. Are there any options for STI brake levers to have your shifting integrated with the lever as well? Unfortunately not! So, if you are use to cycling on racing bike, and were hoping to run the STI’s you are out of luck. From what I understand (and I could be wrong here), is that they will work, but not well. You won’t have the kind of braking power that you would need for V, cantilever or disk brakes.